St Joseph is the paradigmatic just man of the Old Testament with a faith as outstanding as that of the patriarchs, while already living the supernatural charity, humility and virginity of the New Alliance. Like his namesake in the Old Testament, God speaks to him through dreams. But while Jacob’s son eventually rises to a position of power and significance as the right hand of the Egyptian pharaoh, the later Joseph remains hidden and dies before Jesus starts his public life. To continue with this comparison between Jesus’ adoptive father and the patriarchs: Abraham’s faith was put to the test when he was told that he and his wife Sara would conceive a son in their old age, and even more so when he was asked to sacrifice Isaac, thereby seemingly making impossible the fulfillment of God’s promise that his descendants would be as numerous as the stars in the sky. But no less was Joseph who was asked to believe that a virgin could conceive a child through the power of God without the action of man which is more than many a Christian seems able to give credence to today. But how much harder it must have been when he didn’t have an explanation in hand yet for the fact that the woman he loved, who was so pure and good, without offering any clarification, was visibly pregnant. He had himself made vows of celibacy, if we are to believe the visions of Maria d’Agreda and Maria Valtorta, which set him apart from the customs under the ancient Alliance. He must have asked himself if she had gone against hers. Another would have ranted and raged, but he decided to dismiss her quietly. What relief and joy it must have been to him that he was to be the protector of the incarnate Word and of the theotokos! Yet, if he had any expectations of being able to offer Jesus a cushioned existence, he was quickly disillusioned. Instead of giving birth in Nazareth where we can be sure that Mary and Joseph had prepared everything for Christ’s arrival, they had to travel to Bethlehem to find lodging in a mere cave. Because Herod felt threatened by Christ’s birth, they had to escape to Egypt and live the life of exiles there with all the hardship of finding work and lodgings in a country where they knew nobody. We tend to think backwards from Christ’s crucifixion, knowing this was the time chosen by God, but Mary and Joseph didn’t know when Christ’s Passion would happen though the prophecies in the Old Testament had prepared them for it. Hence, their fear for Jesus was real when escaping Herod’s murderous rage or when they lost the boy for three days in Jerusalem. But despite all those hardships, what bliss it must have been to live with Jesus and Mary – the Word Incarnate and the Immaculate Conception -, to experience this perfect love, and to be given the task to serve and protect them as best he could. Then, however, he was asked for the ultimate sacrifice: of dying before Christ started his public life. He could have been of support to Mary while Jesus was travelling and facing the dangers of His ministry. And what a comfort it would have been to her when she was standing under the Cross to have Joseph next to her. But there too, he had to surrender, knowing that God was acting for the best. Joseph was given to Mary and Jesus to face the knots of their existence on earth – knots that were caused by the sins of others or as consequence of the Fall, but which were no less real. He knows the difficulties we face every day and is often invoked to help us when looking for a house, for example. There is a shining example of his concern which happened in New Mexico in the United States in the late 1870ies. 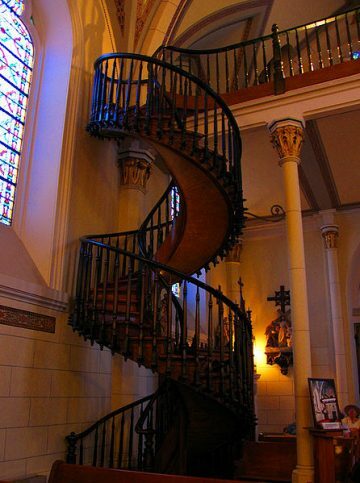 The sisters of Loretto discovered that the architect had forgotten to build a staircase to the choir in their new church in Santa Fe; it turned out to be impossible to put one in without tearing down the whole choir. The sisters decided to pray a novena to St Joseph at the end of which a man presented himself, saying he would build the staircase under the condition that he would have complete privacy. Within three months, this spiral staircase was built without nails or glue, out of a kind of spruce wood, the subspecies of which is unknown. How the wood got there, is only one part of this unresolved mystery. Another is how the stairs can hold without any central support. Only years later a railing was added and the outer spiral was attached to a pillar. The sisters came to believe that it was St. Joseph himself who built the staircase for them. Nothing in our lives is too small or insignificant to be of concern to God and His saints. Let us ask therefore Joseph and Mary to undo all knots in our lives, for they like to be asked. And as we know: God gives superabundantly: “A good measure, pressed down, shaken together, and running over will be poured into your lap” (Luc 6:38).